Motorola is about to launch couple of smartphones in its own specific pattern matching the current trend. Yes, the brand may launch Moto G7 and Moto G7 Plus smartphones anytime soon. We got some leaks and rumors about these two gadgets and would like to share about them over here. The mobile phone is expected to arrive with waterdrop notch design and rear curved glass. 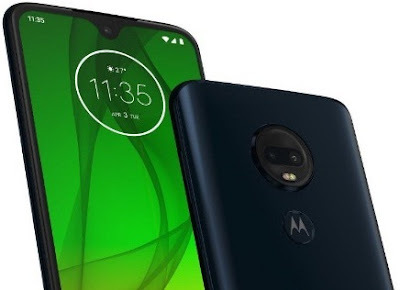 If you are looking for Moto G7 Plus and Moto G7 phones' features, specifications, price, launch date, release date and on then you can get some of them over here. These two mobile phones might come with Qualcomm Snapdragon 670 processor and coupled with 4GB or 6GB of RAM. The internal storage of these devices must be either 64GB or 128GB with an expandable memory option. Hopefully Moto G7 and G7 Plus would run with the latest Android Pie operating system. The display what we heard from the leak is of 6.4 inches Full HD+ with 19.5:9 aspect ratio. With regards to the camera of these gadgets, they may come with 12 megapixel front shooter and 16+5 megapixel dual rear cameras. You can check their rumored specs and price detail below. Stay tuned for official update when Motorola officially launches them. Tips: The brand has released unique pattern smartphone with current specs available in the market. Worth to go with them.